For the Memorial Day weekend, Hollywood dispenses with trivial notions of letting one huge film reserve it all for itself, and throws two highly anticipated sequels out for consumption. Between this and last weekend's big film, if you can't find a reason to get to the theater this weekend, you may be in a coma. The Hangover Part II is perhaps the new standard-bearer for “if you like this sort of thing, this is the sort of thing you'll like”. Two years ago, the first Hangover had a solid opening weekend of $44 million based on a brilliant premise and an extremely well-crafted trailer, which steadily ramped up the incredulity of its characters and their apparently out-of-control night. Legs took it to nearly $300 million, so with only some slight variations – the most significant of which is a scenery change from Vegas to Thailand – we're at it again. 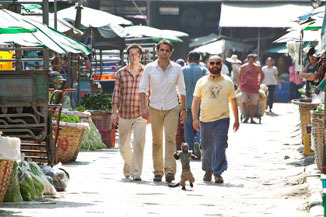 The trio of Bradley Cooper, Ed Helms and breakout star Zach Galifianakis make up the core of the film, with Ken Jeong making the leap from cameo to supporting player (Justin Bartha is mostly MIA again – and after appearing in both these films and both National Treasure movies, will have one of the highest cumulative box office figures of an actor that 98 per cent of the populace couldn't pick out of a police lineup). The question then becomes whether people are willing to pay money to see what's The Hangover's equivalent to the Bad News Bears Take Japan – the answer being... probably. There are in fact some new moments and jokes in Hangover II, and they even snuck their way into the trailer, but it's likely that they number in the high single-digits. That'll work for opening weekend purposes, but should lead to a steep drop in the weeks to come. This is basically found money for Warner Bros. though, so it's hard to feel sorry for them, after what's going to be a massive $105 million five day weekend.